With so many job seekers heading online, recruiting is not easy as it once was. More importantly, ever-evolving regulations regarding questions on your application add complexity. Our attorney-developed Job Application Smart App is the easiest way to accept employment applications online and have confidence you are always in compliance with the most current hiring laws for your state. You'll start with the most current, state-compliant job application. Whenever there’s a change to your state’s requirements, you’ll be notified and your application will be updated to reflect the most up-to-date, compliant version. If you choose, you can customize your job application by selecting optional questions pre-written by our legal and HR experts. So you can be sure you’re asking about the exact skills and background required for the job. With one click, generate a link to your job application or email it directly to a candidate. Then, without needing to create an account or download any software, the candidate completes the application, attaches a résumé and cover letter, and sends it back to you. A summary view makes it simple to review all submitted applications at a glance. With just a click, digitally file and retain rejected applications or, if hired, start the employee’s electronic personnel file. Beyond the required job application questions, you can include questions about skills and qualifications, educational background, references, and other information related to the position. The experts at ComplyRight have created a comprehensive database of questions that make it easy to stay in compliance while still giving you the flexibility to hire smarter – faster. You won’t need to worry if the way you've worded a question is legal or not. Just choose which pre-made questions you’d like to keep or hide on the application. Not web savvy or experienced with HTML? Instantly create a link to your application to share or add it to your website, company LinkedIn profile, email signature, online ad, etc. Have a candidate in mind? 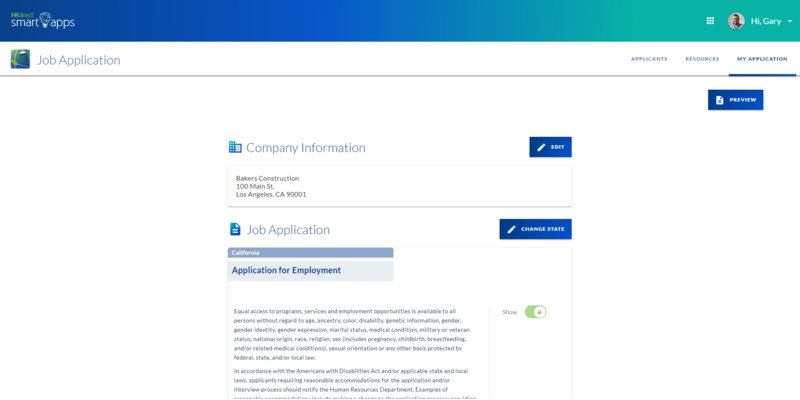 Email your application with a personalized message to a specific candidate right from within the Job Application Smart App. Have frequent walk-ins? Print unlimited copies of the application to hand out or have completed when you bring someone in for an interview. It's the best of both worlds! Did you know that employers are required to maintain all applications for a specified period as proof of non-discrimination? Your Job Application Smart App guides you through the proper retention and removal of rejected applications in compliance with current regulatory requirements to protect and defend your business should you face a discrimination charge. Ready to Get Started with the Job Application Smart App?